The last egg themed week was last year, before I moved. Quite long ago. 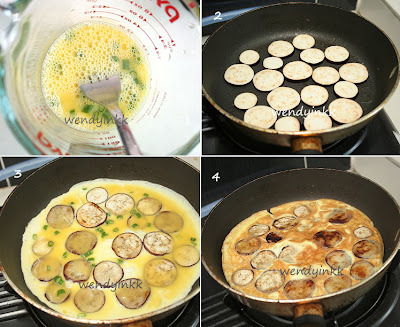 When I saw this recipe, I was caught on by the fact that it used aubergines to top the pancake. I wonder how it tastes like. But I’m not keen on having it as pancakes as I wanted to make this for dinner so I changed it into omelette, thin omelettes. This recipe required a 9 inch non stick pan, but an 8 inch pan will work just as fine if you use smaller eggs. One egg per omelette, so if you can adjust the thickness of the egg, it’s pretty much ok if you use other pan sizes. My omelettes are about 2mm thick. What did you think this looked like if I didn’t tell you it’s topped with aubergines cooked in egg? 1. Slice aubergines as thick as 4mm. 2. 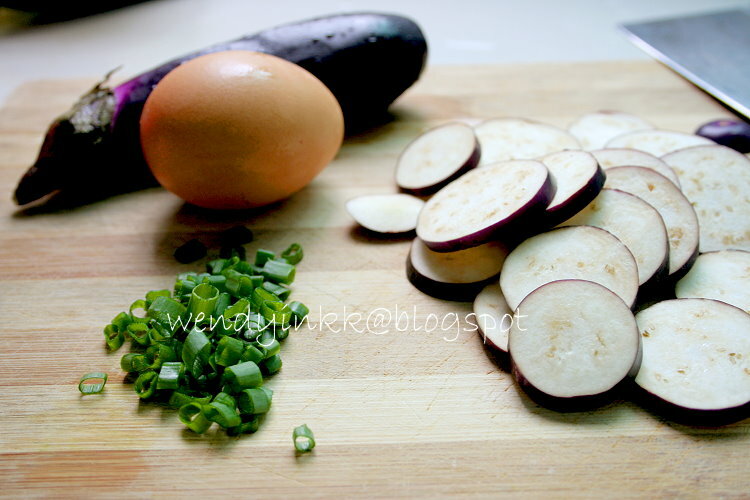 On medium low heat, put some oil into frying pan and lay aubergine slices in pan. Flip them when they are fragrant to fry the other side. 4. Add more oil if it seems dry and fry until the base of omelette seems golden. Flip omelette and fry the other side as well. 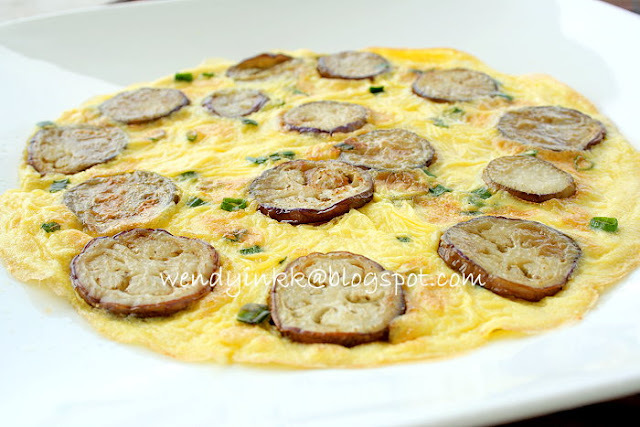 Oh, this is the first time I seeing using aubergine in omelette! Interesting. But unfortunately one of my family members do not aubergine.... what a pity. It is full of nutritious goody inside. Nice ! 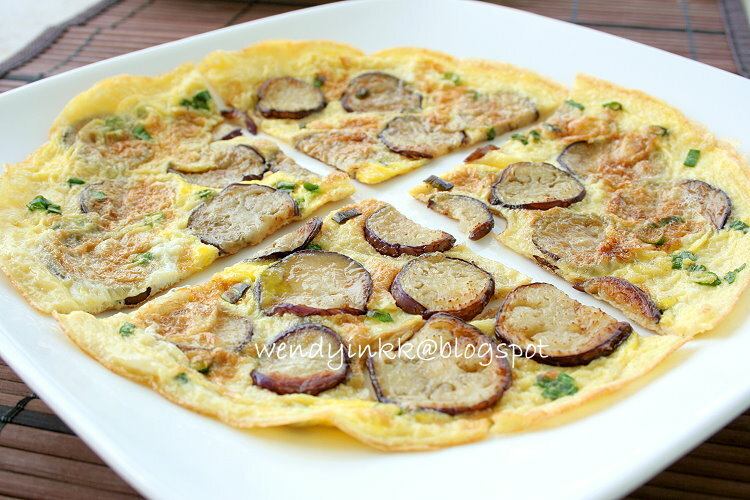 I love anything aubergine...and in an omelette...I am sold ! It looks delicious..simple and no fuss :) Thanks for the idea ! This is so interesting with the aubergine...it looks tasty. 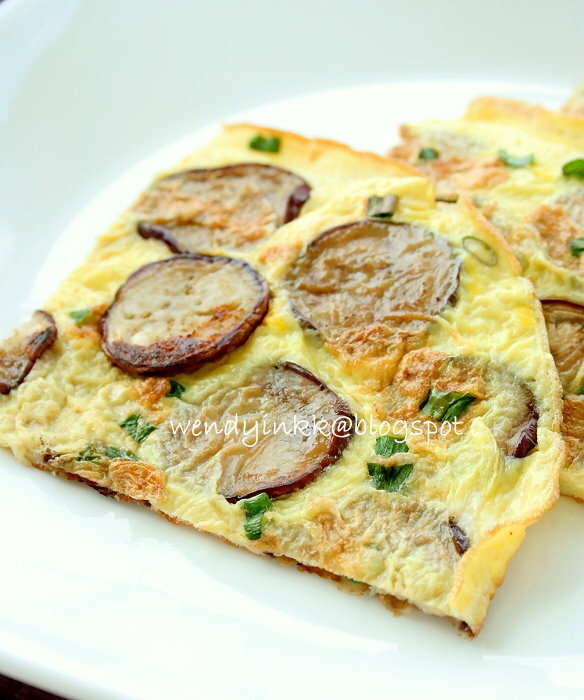 Good for breakfast or lunch! 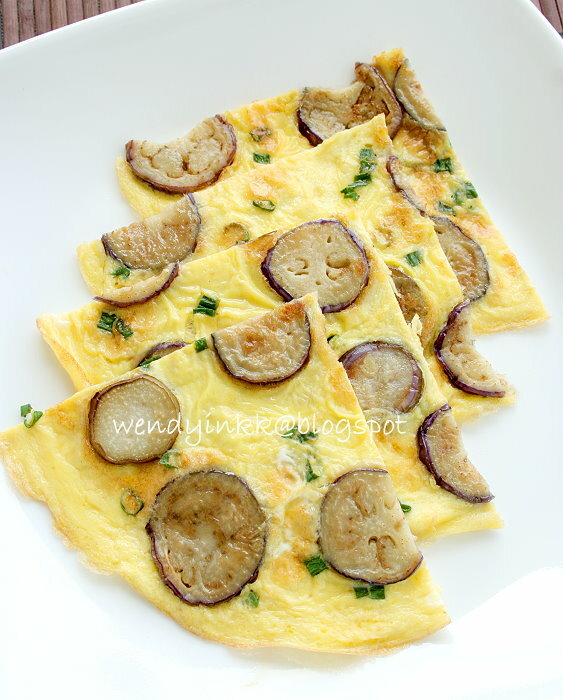 Wendy, I like frying omelette with brinjals but usually I'll fry the brinjals first then mix in beaten eggs. Will try your way next time. Ur method is like how petola eggs is like, right? It looks rather different and even method is different.